Since 2001 I’ve built and sold thousands of the J-Pole antennas. I’ve also answered hundreds of questions about installation, operation and performance. Since there is no such thing as a bad question, I’m listing the most frequently asked questions here. What are the all copper J-Pole antennas constructed with? My J-Pole antennas are constructed out of Type M solid copper pipe for the ultimate in durability and weather resistance. All joints are soldered with rosin core solder. An SO-239 connector is soldered onto the antenna at the point of lowest SWR. Related Post: Why build antennas out of copper and not aluminum or stainless steel. Why copper, isn’t that expensive? Yes, copper is expensive; but it is also one of the most efficient conductive materials available. One of the common elements more efficient than copper is silver. Aluminum is only 60% as efficient as copper. The high efficiency of copper means that more of your signal will be transmitted into free space and not burned up by the electrical resistance of the material. Antennas made out of stainless steel or aluminum may look pretty and won’t tarnish, but they don’t have the efficiency that a true copper antenna can provide. I’ve seen lots of plans and sites selling J-Pole and Slim Jim antennas out of 450 ohm ladder line or 300 ohm TV twin lead. These make good antennas; they are lightweight and can be easily packed when camping or hiking. I use them myself for portable and emergency situations. But you make a tradeoff in durability and efficiency when you go with a thinner material. All Copper J-Pole and Slim Jim antennas will have more sensitivity, lower noise floor, and more bandwidth than a comparable wire antenna. The greater surface area of the copper tubing makes the difference. How do your two meter J-Poles perform on the 440 MHz band? The two meter J-Pole is tuned for maximum efficiency at the 2 meter band where the SWR is 1.2:1 or less at 146 MHz. It is a pretty good performer on the UHF band where the SWR is 2:1 – 2.5:1 between 445-450Mhz. This is still within the range of what modern radios can handle. Can you build antennas for any other frequencies? I can build you a custom antenna for any frequency between 40 MHz and 500 Mhz. If you have a special antenna need, please email me and I’ll give you a cost estimate. I need an antenna for my HF, 10 meter, or CB radio. Can you help? At this time I do not produce any antennas for the HF spectrum. This would include antennas for short wave, hf, 10 meter or CB radios. But I am investigating new products, so check back from time to time to see if I have any new offerings that may meet your needs. How are your antennas shipped? I use USPS Priority Mail to ship my antennas. I find that Priority Mail gives you the best price, speed, and deliverability. The 6 meter antennas are shipped UPS Ground service which works best due to their length. International orders are usually shipped USPS International Priority. More on shipping can be found on the Ordering Information page. Can the antenna be painted? As the copper J-Pole is exposed to the elements, it will develop a dark brown patina. This dark tarnish or patina is only cosmetic and won’t affect the performance in any way. You may paint the antenna with nonmetallic paint to protect it and help it blend into the surroundings. If you want to keep the antenna looking shiny and new on the tower, you can also paint it with a clear enamel paint. I recommend the following procedure if you are planning to paint the antenna. First shine the antenna with some fine ’00’ steel wool. Then clean the antenna with a rag or paper towel soaked with isopropyl alcohol. Alcohol is flammable so do this in a well ventilated area. Also let the rag dry out in the open before throwing it away to prevent spontaneous combustion. Tape the connector up with masking tape and apply one or two coats of spray enamel paint. Is there any special way in which the antenna needs to be mounted? The antenna is naturally at dc-ground, so it does not need any isolation from the mast. The antenna can be mounted directly to a metal mast with hose clamps or U-bolts. The J-Pole can be detuned by nearby large metal objects. You should keep it at least 6 feet away or above metal buildings and the like. Related Post: Do J-Pole antennas need to be grounded? Related Post: Lightning Protection for Antennas. I live in an apartment. Can I still use your J-Pole antenna. You will definitely see an improvement with an antenna like a J-Pole when you compare it to the rubber duck antenna found on today’s HTs. Try clamping the antenna to the balcony or deck railing, to planting it in a flower pot filled with landscape stones. Try putting it into the attic space if you have access. As a final result, prop it up in the corner of the room. If you do that, follow RF safety guidelines and keep the transmitter at a lower power setting. How to I connect your antennas to my hand held portable radio? While the J-Pole antennas are designed to be superior base station antennas, they will all work very well with your HT or hand held radio. In fact I highly recommend the breakaway model for portable use. The antennas have an So-239 connector on them, and I recommend using coax cable with Pl-259 connectors to connect the antenna to the radio. You willl need an adaptor to connect the standard coax with Pl-259 connectors to your portable radio. Radio Shack does sell an BNC to SO-239 adaptor and an SMA to SO-239 adaptor. If you can’t find the adaptors at Radio Shack, try Tower Electronics or Ham Radio Outlet. These adaptors will let you connect an HT to any antenna using standard coax cable. It’s a good idea to have a few of these in your go bag just for these reasons. J-Pole antennas have been designed and constructed out of a wide variety of materials. The choice of construction materials can greatly affect the performance and power handling of the antenna. Typically, the 2 meter all copper J-Pole antenna will handle 250 watts or more of power. Copper is a very efficient conductor and will tolerate and dissipate heat energy very well. I’ve personally tested my 2 meter antenna at power levels up to 170 watts without issue and am confident that the antenna will go higher. How far will this antenna transmit or receive? VHF and UHF communications are primarily line of sight, your range will be dependent on antenna height, transmitter power, and terrain. For example, if you mount the antenna 20 feet in the air, it would not be uncommon to be able to hear portable radios in a 2-3 mile circle, mobiles 5-10 miles, and repeaters up to 50-60 miles. If you live in a very hilly or urban area, these figures could be reduced. Read my testimonials for real world examples of the antenna range. Related Post: How does antenna height affect VHF communications. Related Post: HAAT Calculations: which antenna will work best for me. J-poles will certainly work well as a repeater antenna . They have an omnidirectional doughnut shaped radiation pattern. This makes them a good choice as an antenna for low to moderate elevation levels and would be a great choice as a remote base or receive antenna on a repeater system. My Slim Jim antenna is a perfect choice for a repeater. It has a folded dipole design that gives it more gain and a lower angle of RF radiation, (7 degrees, vs 20 degrees). The Slim Jim concentrates more RF energy towards the horizon. Related Post: J-Pole and Slim Jim Repeater Antennas. How does your six meter antenna perform? The six meter antenna works really well. I had one ground mounted and was able to hit a repeater 40 miles away with 5 watts. The return signal was about half scale on the on the radio and I had excellent signal quality going into the repeater according the other half of my QSO. Another person mounted his on his chimney and is able to talk simplex with 100 watts for more than 40 miles and still have a full scale signal. These examples exhibit average behavior of the antenna, but your mileage may vary. What type of Connector should I select? SO-239 or N? The standard option is the SO-239, but you can also request an N Female connector. What’s difference between these connectors and which should you choose? Well, the SO-239, also called the UHF female connector is commonly used on amateur radio equipment and antennas. If you have a mobile radio, there will be an SO-239 on the back. If you are using an HT, you will get an adapter with an SMA on one end and an SO-239 on the other end. Then, the coax cable you’ll use will have PL-259 connectors on each end. The PL-259 mates to the SO-239. N connectors have the advantage of being lower loss on VHF/UHF frequencies and forming a water proof connection. N connectors are preferred by people running on UHF or microwave frequencies or using commercial equipment. So if you are using radios with N connections on the back, or have cable with male N connectors installed, then ordering the antenna with the N female connector makes sense. But the vast majority of amateur radio gear uses the SO-239 / PL-259 combination and over 90% of my sales are for antennas with SO-239 connectors. So, the bottom line is, unless your particular needs require the N connector, order the antenna with the SO-239. What type of coax should I use? A loss of 3 db will cut your power in half. A six db loss will cut your power into 1/4. I recommend RG-8 if your cable run is over 50 feet and RG-8X if it is less than 50 feet. You shouldn’t use RG-58 for VHF/UHF unless it is a very short run (less than 15 feet.). GMRS J-Pole users should only use RG-8 for short runs and Belden 9913 for longer runs. Loss figures for other frequencies and cables can be found at the Cable Experts. The SWR is really high on my antenna. What should I check? Here are a few things you can check if your SWR is high. Check the coax, make sure there are no problems associated with it. The connectors should be well soldered or crimped without any shorts and there should be be any apparent kinks in the cable. Check the mounting location, nearby buildings will affect the SWR. Keep structures at least six feet away from the antenna, or make sure the antenna is above the structure. Make a balun to keep RF from coming back down the coax. Make a coil of about 5 loops of coax with a coil diameter of about 6 inches. This coil should be located about a foot away from the feedpoint of the antenna. Secure the coil with cable ties or electrical tape. Related Post: Does my J-Pole antenna need a choke balun. Inspect the antenna itself. Is the solder loose or cracked at the feedpoint. If it is, let me know. Drop me a line on my contact form. I’d be glad to answer your particular questions concerning J-Pole antennas and my antennas in particular. Most impressive web site. Full of information. I want one. what is the gain in DBD ??? how much to make one for me on 104.9 mhz ? The LPFM J-Pole antenna is a half wave antenna by design and has about 2.15 DBD of gain. Price for the LPFM antenna tuned to 104.9MHz is the same as the other low power fm j-pole antennas, that is $49 + $12.00 shipping. I purchased a j-pole 2 meter from you a few months ago, and wow, does it ever work. I live way down in a valley, with an approximate 700 ft drop from the main road, and I have no problem at all, hitting my local repeater. I am getting ready to extend the height of my antenna mast, and I think I will get even better transmit and receive, as I am right against the side of my metal roof. I appreciate your help, and will most likely buy another for my scanner. Thanks again! Buy this antenna; you WILL NOT be dissapointed! Radio Shack makes a SWR meter I believe is geared towards CB antennas. Would it work for the 2 meter dual band j-pole? Or is it not accurate enough? Suggestions? Thank you for your interest in my antennas. The SWR meter that Radio Shack sells works well for the HF bands under 30MHz, but will give you inaccurate results if you try to use it on VHF/UHF frequencies. You are correct, the meter is geared towards the CB band. Just ordered your 220 unit and read about keeping it 6′ away from other metal objects. How about mounting it 3′ above a horizontal pair of 75m horizontal hamstick dipoles, with the 220 J pole and dipoles sharing the same mast on the rotator? Any performance degradation or problems to watch for? Should I use a non-conductive mast? If the antenna is alongside large objects and structures, then you will want to keep it at least six feet away so that the antenna does not couple with the structure. If you are are mounting the antenna above the structure, then you will be fine. Objects below the antenna won’t affect it, so you can mount it on the same mast as your hamstick dipoles. Since the J-Pole is a half wave antenna by design, it doesn’t require a groundplane or special grounding. You can mount it on a non-conductive mast. Good stuff. I found what I needed. My SWR was in the red. I made balum coil and it dropped to .5 for 70CM and 2M. Thanks. is there a benefit or disadvantage to using solid copper rod v/s copper tubing? if so, how does diameter affect quality? i have access to 3/16 to 1 inch rod. just curious, thank you in advance. There is really no advantage to using solid copper rod vs tubing to build an antenna. The reason is that RF energy travels along the surface of ‘skin’ of the metal and not through the core like electrical energy does. Therefore surface area is more important than thickness, especially for the higher VHF and UHF frequencies. I have some extra 3/4″ copper rigid plumbing line. Will this wok like the 1/2″ or is the surface area an issue ? 3/4 inch tubing will work just as well at 1/2 inch. In fact the surface area will give you a little bit more bandwidth, so go ahead and use up your leftover copper for the antenna. Am planning to mount it atop a 10 foot galvanized metal mast that I have. You say that the antenna doesn’t need any isolation and can be mounted directly to the mast but he picture you show at the top seems to have the antenna isolated from the mast by a section of PVC pipe. Thanks for point that out, I should rewrite the FAQ so that it is a little more specific. The J-Pole antenna is a half wave vertical antenna, and can be mounted to a metal or non-metal mast without affecting it’s performance. The antenna pictured at the top of my FAQ page is the 2 meter Slim Jim antenna. Both antennas are similar in that they use a J style matching system consisting of a 1/4 wave stub, but the difference between the two is that the Slim Jim is a half wave folded dipole antenna. It performs best if it is isolated from the mast. That’s why I provide a short section of PVC pipe to use as an insulator. I hope this answers your question, let me know if you have any others. LMR-400 ultraflex is a great low loss coax cable choice. If your feed line run is 50+ feet, I’d certainly use a cable like that to minimize the losses. i have a 15ft pole mast above the roof and a 2m folded dipole installed 8ft, so it still have about 7ft above it… question is, can i install your j pole on the tip of my mast? can it not desense the receiver end(j pole) when i tx on my folded dipole? Hey, i have one question for you. I have purchased your J Pole antenna for ham radio operations for 2 meters and 70 CM’S and i love it, it does wonders. I was wondering how well this antenna would perform on recieving the FM broadcast band 88 – 108 MHz. 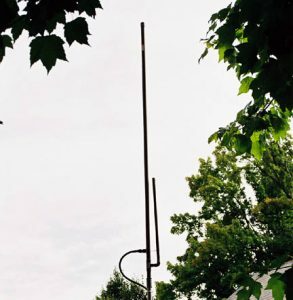 No broadcasting, just listening and was just wondering if this antenna would be ideal for listening to this portion of the VHF band. It’s good to hear the antenna is working great for you. J-Poles make excellent broad band receive antennas, so they do a great job picking up VHF/UHF transmissions. But the FM broadcast band is a little low on the VHF scale for the antenna. It will pull in the stronger stations, but will most likely struggle with picking up weaker signals. I am a new HAM and have decide to give a try for better SWR with my homemade OSJ- pole antenna. I’ve surprised that when double-lengthen the short stub( for the70cm band) up to 37 cm (about 14.5”) the SWR lowers to under 1,2 and 1,1 for the 144 Mhz band at the same time. It seems also this change has improve the reach of a particular distant local 70 cm-band repeater . My question is – does this re-design spoils the hall performance of this antenna regardless of the low SWR ? With the J-Pole style antennas, adjusting the lengths of the individual elements can affect the SWR, and there are multiple combinations that will give you a 1:1 SWR. The bigger question is how these changes affect the antenna’s radiation pattern. Lengthening the 70cm element may be lowering the RF radiation angle, but without modeling the antenna and doing some live testing, it can be hard to definitely say. The important part is to keep experimenting, and if the results work you, go with it. Michael – I looked for a while as a new ham for a low cost antenna with no frills. The antenna along with this incredible web site was the answer to my search. Can’t wait to get the antenna up.